As a brand, you need to be relevant. If you haven’t updated the look of your website for five years or so, now is a good time to do it. Otherwise, you risk falling behind competitors who also have websites, and are more in tune with the needs of today’s customers. To give you some ideas on how to update your site, here are eight web design trends you can adopt as your own. Before the almost-flat or semi-flat web design, there was the flat design. The idea behind the latter was a look stripped of all fluff and frills – using bold colors, simple shapes and simple typography. The most well-known example is the Windows 8 interface – which didn’t do well, unfortunately. 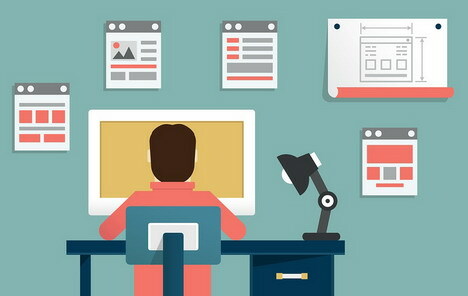 So, to eliminate the problems of flat design while maintaining its better qualities, designers came up with almost-flat. Here, some elements are given depth and dimension to balance out the flatness of the other elements. Gmail best demonstrates the beauty of almost-flat design, as shown below. Few design elements add personality to your site better than hand-drawn illustrations. They give this quirky, yet friendly edge to your brand, and can’t be easily replicated by competitors. Whether you’re a creative, a business that wants to appeal to creatives or simply a brand that wouldn’t touch the words boring and ordinary with a 10-foot pole, this is a must-add to your site. Of course, you don’t need to create the illustrations on your own. Freelance artists are a dime a dozen on sites like DeviantArt and Tumblr, so it’s only a matter of browsing through their work, and hiring them based on how well their art style meshes with your brand. Typography isn’t just the art of designing letters. Done right, it can breathe life into your text content, enhance the rest of your site’s design elements and help your brand stand out. Done badly, it can become a huge flaw in an otherwise flawless site. It’s possible to download free fonts from around the Web. However, a professional designer’s customized typography is better for emphasizing your brand’s uniqueness. Also, a basic knowledge of how to make typography work helps you stay on the same page as your designer. Think your website’s too plain? Try adding an image or two to the background. It can be a single, eye-catching photo spanning the entire page, or a series of photos that tell your brand’s story.